Folkestone is going to go through change. It has a new Seafront Development proposal to build 1,000 new homes at the harbour together with additional retail outlets. Later there is also the prospect of another larger development at Shorncliffe Barracks. 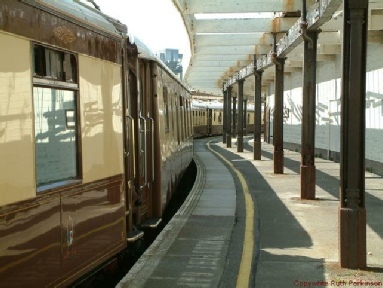 The Remembrance Line Association has gained agreement from English Heritage for the viaduct and swing-bridge to be Grade II listed and the developer has kindly shown the Station Masters House, Signal Box and "Bullion Room" to be retained within the development. Our campaign is seeking to place efficient "green" rail transport within the Seafront Development to improve the town's mobility for both residents and visitors. We aim to provide a Tram-train service to connect with HS1 services from and to London, provide a park and ride service to reduce traffic within the town and ease long stay parking, linking these to the award winning coastal park and, using the Leas Water Lifts, to the town centre. The route will continue use of the historic Harbour Branch Railway and fit in with the Seafront Development plan. If a fast ferry service can be established with Boulogne then it may be possible for passengers to walk a short distance between the Tram-train and ferry and the same could apply with visiting coastal cruise ships (or if at the remotes end of the Outer Pier - could be serviced by similar "green" Tram-trains). Folkestone Harbour Company have already realised the national importance of the Outer Pier within UK history. They are retaining and restoring the now unique platform canopies and conserving the World War I Jeffrey Sisters and Mrs Sturt's café site - all fitting in as part of the 100th anniversary events and for future generations to enjoy. We believe that once capital investment has been secured the project can be viable and repay its stakeholders. If this can be achieved then the project could also become part of the Shorncliffe Barracks development to provide a link to mainline rail and link the communities across the town without adding increased traffic. We invite you to join the Remembrance Line Association and help us achieve our goals.